Victorians, Colonials, Cape Cods—homes are unique to our personalities. At Fountaingate Gardens, we understand that one size doesn’t fit all. That’s why we will offer 15 diverse and spacious floor plans to satisfy the needs and desires of sophisticated seniors. Today’s Life Plan Communities, also called Continuing Care Retirement Communities or “CCRCs,” offer spectacular amenities both inside and outside of your residence. 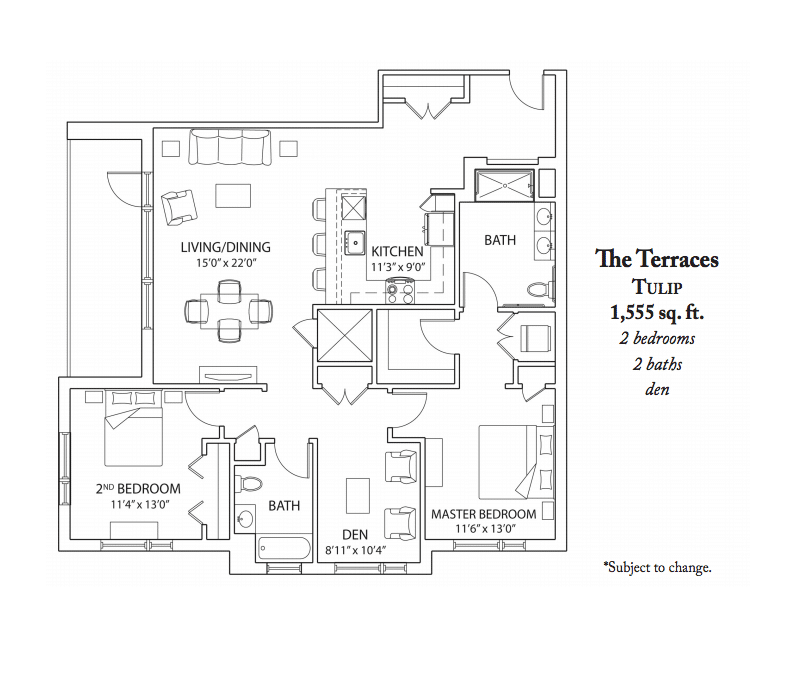 The Tulip, our spacious 2-bedroom, 2-bath with den floor plan, is sure to delight even the most discerning shopper. As soon as the front door opens, a clear sight line from the foyer to the kitchen and extending to the dining and living area shows off a modern, open-concept design. Floor-to-ceiling windows lead to a spacious balcony and bring nature inside. The kitchen’s oversized breakfast bar offers additional space for entertaining family and friends. The open design, filled with natural light, allows you to pass through spaces with ease. The 1,555 square foot apartment home includes a bright and spacious master bedroom suite with a lovely master bathroom and large walk-in closet. Just down the hall, a den serves as an added space to read, watch TV or surf the Internet on your Wi-Fi – it’s included! An additional bedroom just steps away is the perfect place to create an inviting guest room – or your own creative space! With a nearby oversized bathroom, the additional bedroom can also function as a second master bedroom. 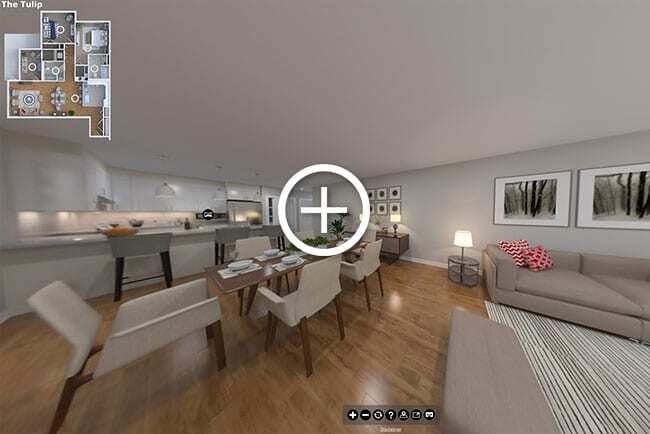 See the new virtual tour of the Tulip! This is a conceptual, artist rendering of the soon to be built Fountaingate Gardens and is subject to change. You’ll also have plenty of storage space in this home, with spacious closets placed throughout the residence. Be it a shoe collection, fine linens or golf clubs, your treasures are within arm’s reach. As you plan your move to Fountaingate Gardens, you have the opportunity to create a living space that is authentic to you. Pick your paint colors, flooring, cabinetry, countertops, fixtures and more. These upscale details will make your new residence feel like home. Regardless of the floor plan you choose, living at Fountaingate Gardens means you’ll experience an array of exceptional amenities including chef-prepared meals, fitness and wellness classes, nature trails, campus Wi-Fi, underground parking, housekeeping and linen services, multiple dining venues, a game room, art center and so much more. And best of all, you’ll never have to worry about cutting the grass, shoveling the driveway or pruning the trees. With chores off your to-do list, you’ll have time to relax in your new home, socialize with friends and focus on your passions. If you’re ready to step into an active lifestyle, call us today at 631-210-5806 for more information on our many floor plan options. What’s the Value of a Life Care Contract?